Massimo Busacca refereed the 2007 UEFA Cup and one of the semifinals from Euro 2008. Busacca, 40, will be assisted by his compatriots Matthias Arnet and Francesco Buragina, while the fourth official will be Claudio Circhetta. 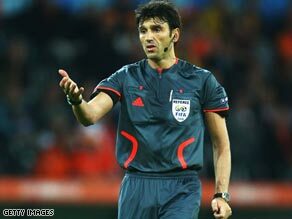 Busacca has been an international referee since 1999 and has taken charge of 32 Champions League matches, including six this season. Among the top club matches he has overseen are this year's Champions League quarterfinal second leg between Porto and Manchester United and the 2007 UEFA Cup final between Sevilla and Espanyol in Glasgow. On the international stage, Busacca was also in charge of the Euro 2008 semifinal between Germany and Turkey and the 2006 World Cup last 16 match between Argentina and Mexico. Meanwhile, authorities in Rome have enforced a blanket ban on the sale of alcohol as they attempt to stave off the threat of trouble between 67,000 Barcelona and Manchester United fans. In a bid to avoid incidents, local authorities have banned the sale of alcohol throughout the city and in airports and stations from 11pm on Tuesday until 6am on Thursday morning. "It will not be a militarised city," Rome authority spokesman Giovanni Pecorari told Press Association Sport. "All the necessary measures have been taken in order to give the best possible image of this city."